2019 is just around the corner and the best way to kick off the New Year is by planning a one of a kind international vacation for you and your loved ones. One of your New Year’s resolutions for 2019 should be traveling to some of the most fascinating international destinations that could redefine the way you see yourself living your life. This type of trip can make you feel rejuvenated, enriched with new experiences, and help you broaden your horizons. We have curated a comprehensive list of awe-inspiring international destinations for you that will bring you home ready to plan another trip! Meknes is one of the most charming cities of Morocco and boasts a rich historical background. A city revered for its architecture, Meknes enjoys a laid-back vibe and is enveloped by a picturesque countryside of rolling plains, green valleys, and tall mountains. Meknes happens to be one of Morocco’s numerous UNESCO World Heritage Sites and earned its place on the list for its unique fusion of architecture and a well-maintained cultural heritage. The best time of the year to visit Meknes is during the Spring months of April and May, before the full heat of a desert summer sets in. Some of the preferred attractions to visit during this time are the Mausoleum of Moulay Ismail, Bab Mansour and Dar Jamai Museum. The Roman ruins of Volubilis are also a major attraction, drawing hundreds of thousands of visitors every year to this romantic Moroccan city. Croatia offers a diverse array of attractions with many historical towns, the beautiful Karst Mountains, scenic landscapes, the stunning blue of the Adriatic Sea, and world-renowned national parks. The town of Zadar is known for its fine marble pedestrian-friendly streets, spectacular medieval churches and Roman ruins like the famous Church of St. Donat, established on the site of the former ancient Roman forum. The promenade that meanders through Obala Kralja Petra Kresimira IV offers a leisurely stroll for visitors in the Spring months. If getting some sun is on your agenda, then look no further. Zadar offers gorgeous sun-kissed beaches along the shoreline of the Adriatic. The ideal time to make the most of your vacation in this city is during the summer months of May and June. Zadar offers an alluring fusion of ancient and medieval heritage and a buzzing nightlife at the waterfront. Copenhagen, the Capital and largest city in Denmark, is one of the most easy-going cities in Scandinavia. Copenhagen offers a unique European touch, warm and welcoming locals, and a robust café culture that has charmed many a visitor. Copenhagen is a perfect city to just move around at your own pace, enjoy romantic drinks on a pleasant July evening, or partake in a home-cooked family dinner in a traditional summer house while the sun sets over the ocean. Copenhagen is known for its cobbled streets lined with bars, cafes, and restaurants. The Vesterbro District has a pulsating vibe especially during the summer months of June, July and August. There are numerous outdoor events, concerts, and picnics in the park, as well as urban swimming in the cities' various harbors. Some of the most popular attractions in Copenhagen include Tivoli Gardens, Christiansborg Palace, Nyhavn Harbor, Amalienborg Castle, Strøget Shopping Mile, Rosenborg Palace, Kastellet & The Little Mermaid and Town Hall Square which offers a brilliant example of traditional Danish architecture. Kathmandu is a beautiful, vibrant, bustling city in the heart of Nepal. The city is a unique mix of temples, historic sites, shrines, restaurants and busy streets. The best time to visit Kathmandu is during the winter months of October and November. While in the city, you must include the grand Pashupatinath Temple on your itinerary which also happens to be the UNESCO site of Boudhanath Stupa, the (monkey temple of) Swayambhunath and the Kopan Monastery. Additionally, there is the Nyatapola Temple, Durbar Square and Taumadhi Square. If you want to get a taste of Nepal’s rich culture, Taleju Temple should definitely be on your list. Shenzhen is one of the multiple mega metropolitan centers in China. The city is a thriving art center with a wide array of museums, galleries, theaters, and other attractions that have contributed towards Shenzhen securing its place on UNESCO's Creative Cities list. The perfect time of year to visit Shenzhen is from October to December. Some of the most popular attractions in the city include the Diwang Mansion which gives you a panoramic view of the city, OCT Loft Creative Culture Park where you can find plenty of art galleries, cafes, live music venues and fascinating bookstores. You can also look forward to spending some quality time in nature with the Nanshan Mountains, which offer spellbinding views of the ocean and the tranquility to soothe your senses. Some other noteworthy attractions include Sea World, a westernized entertainment district and Futian Central Business District. Those wanting to relax by the beach and sunbathe can head off to Dameisha and Xiaomeisha beaches offering stunning cliff sides and a modern marina. So, pack your bags this New Year and head off to these spellbinding international vacation destinations to make 2019 your best travel year to date. 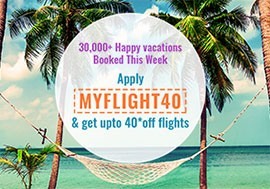 Search any of these destinations now on MyFlightSearch.com!